Re: who can forget "Chenora"
In an effort to create an identity for the neighborhood between Belltown and Pioneer Square (the blocks between Lenora Street and Cherry Street on the north and south, and Third Avenue and Western Avenue on the east and west), local marketing firm Tip Top Creative has given the area a "place brand." Starting in September, residents and property owners in the zone will find themselves part of "The West Edge," a name Tip Top marketer Debbie Campbell calls "fun and bright." 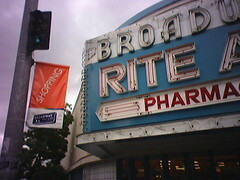 The firm's services (converting social problems like homelessness and vacant storefronts into marketing tools like "edginess") were contracted by the Metropolitan Improvement District (MID), a neighborhood development organization funded by a voluntary tax on downtown property owners. Sylvia McDaniel, a spokesperson for the Downtown Seattle Association, which set up the improvement district, says branding neighborhoods is a popular national trend. "Branding brings identity and recognition to your service, product, or destination," she says. "It also provides the customer with a total experience they can embrace and gives them more of a reason to buy than, 'It's just a good product.'"